I’d like to introduce you to the tenth interviewee in my ‘Meet the Author’ series. He is Glenn Muller. Question: Hi, Glenn! Welcome to Susan Finlay Writes blog site. Can you tell us a bit about your background as a writer? Also, do you have a favorite writing place or favorite music to listen to while you write? Answer: Hi Susan! I appreciate the invite. Writing has been my creative outlet for as long as I can remember. My first “publication” was a six or eight page booklet on aircraft that I stapled together in the third grade. I wrote a fair bit of poetry throughout high school and into college. Some short stories followed and, later, when I joined a various clubs I got into writing topical articles and creating presentations. On a more professional level, I have written some book reviews for Astronomy Magazine, a sports column, and couple of editorial pieces for a local newspaper. I generally write in my home office, though having a laptop means I can find a sunny spot elsewhere, or take it on the road when my wife and I head out to various camping spots. I have an extensive music collection and, occasionally a tune will will inspire a scene but rarely is it connected to what I’m writing. Generally, though, when I’m deep in thought I tend to tune everything out, including my wife. I guess one could call that an occupational hazard. Question: When I first met you, it was on Authonomy, an online writer’s community run by HarperCollins. How did you come across the website? What was your experience like? Answer: Once I had Torque in a somewhat polished state, I felt it was time for some external input so I started surfing the web looking for writer’s forums. After checking out a few, the one that seemed right for me was Authonomy. I posted the whole book on the site and several people read it. There were many positive comments, along with a few excellent suggestions, and one person, T. Donna Robison, went through each chapter and picked out the typos and grammatical errors that a writer always seems to miss. With that final piece of editing, Torque was ready for prime time. While a lot of writers come to Authonomy hoping to attract the attention of an editor, I feel the site has real value as a proving ground to get the kinks out before exposing your work for publication. It’s also a good place to make contacts and I’ve made some nice friends there. Question: You self-published your thriller/crime novel in March, 2013. Can you tell us a bit about your book? What inspired you to write it? How did you come up with the title? Are you writing a sequel? Answer: The main character, Chas Fenn, is a jaded driving instructor who inadvertantly gains possession of the formula for a new street drug. Torque is a high-action tale with strong characters and a virago of a protagonist called Brittany Reis who will stop at nothing to get the formula back. My past life as a driving instructor provided the basis for the story. The other inspiring factor was a need to take my writing to another level. Scenes or chapters would come to me when I was trying to do some other useful thing, like have a nap, so I began to write them down. Several scraps of paper later, I had to admit that there was a book in me that wanted out. I didn’t set a deadline for completion, and the journey took a longer than anticipated, but I enjoyed practically every moment of it. The title didn’t become obvious until I had nearly completed the book. Torque is a term often related to horsepower, but it also refers to the pressure the characters apply to each other. Either way, too much torque can be a dangerous thing – unless you want tension and then it’s perfect. Torque was not meant to be the first of a series. It was to be the book I always wanted to read. However, if it garners enough attention then I’m open to adapting one of my current story lines to accomodate some of the characters in a sequel. Question: Where did you get your book cover? Did you design it yourself? Answer: Torque had three different cover designs before the one that now graces the front. They were designed either by a professional cover artist or by myself. None of them quite checked all the boxes for me so, going back to basics, I came up with a stark three colour palette with clean lines much like road signs. Not only is it distinctive and easily recognizable, but the important features are easily defined even at a thumbnail size. Question: There’s a lot of information out there about how to self-publish. How difficult was it for you to self-publish? Why did you choose to go that route? Are you happy with your decision? Answer: After I’d spent months canvassing traditional publishing companies, I realized there are a lot more authors than contracts. More research revealed the dynamic of publishing has changed and whatever a “house” can do, I can source for myself – and therefore go to the head of the line. Once I’d decided to control my own future, I had Torque on the open market within three months. I’m very happy with the decision. I’m comfortable with computer programs, so the process of formatting the manuscript for an ebook, and preparing it for paper print, was really more time consuming than it was difficult. For those who want to self-pub there is plenty of instruction on the web, and I particularly recommend downloading the free style guide from Smashwords’ Mark Coker. Question: How does it feel to be a ‘published author’? How are you dealing with marketing and advertising? Have you done any public launch parties, book readings, or book signings? Answer: How does it feel to be a published author, you ask. Well, after you get over the jet lag from flying to a book release in Milan, champagne signings in Prague, and launch parties in Paris, you are more than ready for some R&R in Costa Del Sol – Oh, you mean me – how do I feel? Well, even without the above it still feels great! There is a wonderful sense of accomplishment and satisfaction to have a book with your name on it, in circulation. At the time of this writing, I am planning a book launch – most likely at a classic car meet as a nod to Fenn’s affinity for muscle cars. Question: Have you met any fans in person? Answer: I’ve sold several books to friends, of course, and a couple of them have volunteered to be groupies on the book tour. Does that count? Answer: I make a concious effort to obey only three rules. Show don’t tell, maintain an active rather than passive voice, and don’t use four words when you can get by with three. Answer: John Le Carre, Elmore Leonard, Raymond Chandler, Tom Clancy, Alister MaClean, Ian Fleming, Clive Cussler. Having said that, when writing Torque I intentionally read very little because I didn’t want my own style and story to be affected by another writer. Question: If you could meet any book character, who would it be. Question: What would you do with Robin? Answer: Poach the King’s game, drink the Friar’s wine, steal from the rich and set up a trust fund for the poor with a high interest rate and annual annuity. Oh, and rescue the odd damsel in distress – as long as she wasn’t too odd – sometimes you can’t tell until it’s too late. Answer: There are several scenes in Torque that I really like. I have to refrain from saying more because of spoilers, but anyone who wants to discuss their favourite bits of the book is welcome to contact me. Question: Which books are you currently reading? Answer: Right now I’ve got three on the go. Vespa, a horror story by Dean Lombardo; Joyful Wisdom, a Buddhist meditation book by Yongey Mingyur Rinpoche; and Shakespeare’s Landlord, a mystery novel by Charlaine Harris. My taste, or lack of it, is wide ranging and I read for knowledge as much as for entertainment. I just wish I had more time to do so. Thanks Susan. This was fun. When I get some time I’ll be setting up an interview blog and get you on. Glenn Muller is clever. I smiled a lot when I was reading this interview. He sounds as interesting as his character, Chas Fenn. 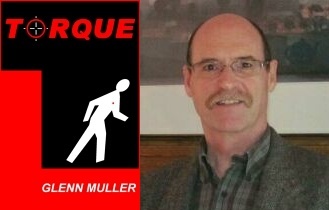 Leave a reply on "Meet the Author: Glenn Muller"